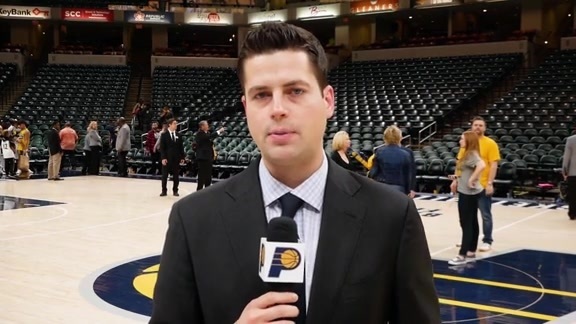 Sept. 20, 2017 - Pacers head coach Nate McMillan discusses Indiana's overhauled roster and his early thoughts on who might be in the starting lineup at the Pacers Foundation Golf Outing. Sept. 20, 2017 - Pacers center Myles Turner reflects on the team's new-look roster and talks about taking on more of a leadership role in his third NBA season at the annual Pacers Foundation Golf Outing. 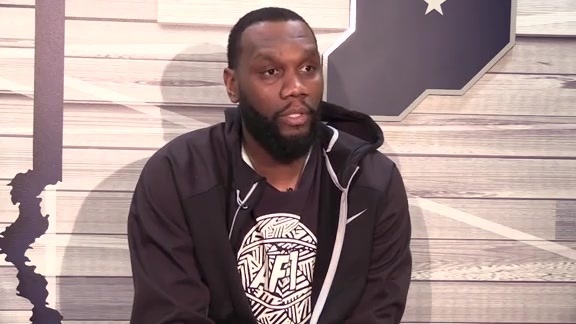 Sept. 20, 2017 - Pacers center Al Jefferson discusses his new diet and dramatic weight loss that he hopes will help him have a bounceback season in 2017-18. Sept. 20, 2017 - Pacers rookie center Ike Anigbogu talks about preparing for his first year in the NBA and rehabbing a knee injury suffered prior to the Draft. Sept. 20, 2017 - Pacers forward Glenn Robinson III discusses getting ready for his fourth NBA season and all the new faces in the Indiana locker room. Sept. 20, 2017 - Pacers forward Domantas Sabonis talked about scrimmaging with his new teammates at the St. Vincent Center and what he's been working on over the offseason at the Pacers Foundation Golf Outing. 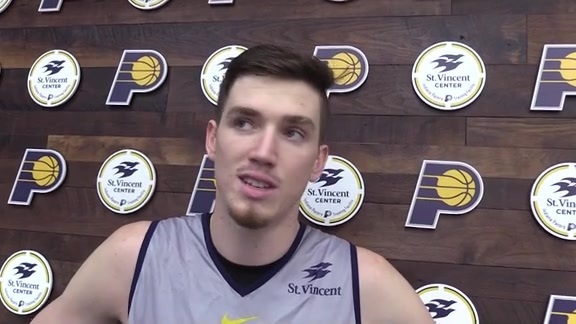 September 20, 2017 - Pacers forward TJ Leaf discussed his anticipation of the upcoming season at the Pacers Foundation Golf Outing presented by Gibson Teldata. Sept. 20, 2017 - Pacers guard Lance Stephenson talks about getting to know his new teammates and the possibility of him taking on a sixth man role for the upcoming season. Sept. 20, 2017 - Pacers guard Darren Collison talks about how he's grown since his first stint with the Pacers and his impressions of his new teammates from early pickup games. Sept. 20, 2017 - New Pacers point guard Cory Joseph discusses his excitement for the season and how several young players will have opportunities to take on bigger roles. Sept. 20, 2017 - Pacers forward Thaddeus Young talks about how the summer helped him heal from his lingering wrist injury and discusses his impressions of his new teammates. New-Look Pacers Bring "Different Energy"
Training camp begins next Tuesday, so it's beyond early to evaluate the Pacers. But the initial impression from their workouts together and their time together off the court is that they're more...together. Veterans Paul George, Rodney Stuckey, Monta Ellis, Jeff Teague, Aaron Brooks and Lavoy Allen are gone, opening doors for a younger and apparently hungrier cast of nine new players eager to establish themselves. Myles Turner, who at a mere 21 years old is the longest-tenured Pacer, raved about it Wednesday at the Pacers Foundation Golf Outing presented by Gibson Teldata at the Brickyard Crossing. "Energy, man," Turner said. "The energy is different in the building, man. It's so much more positive. The energy is incredible." "Just the youthfulness of everybody. Everybody comes with such a different mindset. Sometimes veterans come in and they've done it so many times. (These guys) are really looking forward to getting out there." Turner is the most veteran Pacer, but not their most veteran player. Al Jefferson (32), Darren Collison (30) and Thad Young (29) are bona-fide veterans, and newcomer Bojan Bogdanovic is 28 years old, but the average age of the roster will drop significantly. The trade that sent Paul George to Oklahoma City was a major force behind that, exchanging a 27-year-old for Victor Oladipo (25) and Domantas Sabonis (21). The players appear to have moved on from that deal, which was the biggest story of the off-season. "Everybody wants to talk about the whole Paul thing, but we've blocked all that out," Glenn Robinson III said. "We're looked at as an underdog team, but we're coming in very hungry. "I'm excited for this team. It seems we all have our minds in a great place and are ready to get better." Coach Nate McMillan said he has a starting lineup in mind heading into training camp, but wouldn't reveal it. He did acknowledge, however, that Lance Stephenson likely will start the season as the sixth man. Stephenson likely will play starter minutes, but his versatility and energy makes him a logical candidate for playing off the bench. "I hope he can establish (that role)," McMillan said. "A sixth man is like a starter, and he can be a guy who can do a lot of things with that second group with his ability to handle the ball, score the ball. He's an unselfish player." Stephenson, who revitalized the Pacers with five remaining games last season, has a chance to revitalize his career this season. He left the Pacers in 2014 as a free agent, but failed to latch on with Charlotte, the Clippers, Memphis or New Orleans. He also played with Minnesota last season, but an injury led to him being released and made him available to the Pacers after Stuckey was injured. "I expect the maturity to show in his game," McMillan said. "There have been several teams that gave up on him. He gets another opportunity to come back to Indiana where he's had a lot of success. But he still has something to prove." Stephenson, who has settled into a home in Zionsville, said he has no problem playing off the bench. "It doesn't matter," he said. "I'm just happy to be on the floor. This is going to be a good season. This is a season where I can prove myself and...get back to that All-Star level. "Whatever it takes to win." Stephenson, who said he has fully recovered from the ankle and knee injuries that limited him late last season, also hopes to make this his last stop in the NBA. "My plan is to retire here," he said. Al Jefferson wasn't exactly scarce at Wednesday's golf outing, but less of him was seen than usual. He's dropped 40 pounds from his weight entering training camp last season, and 20 pounds from his end-of-season weight. He said he's down to 275 and wants to get to 265, his weight when he entered the NBA out of high school in 2004. He's done it by switching to a vegetarian diet, a move motivated by becoming sick after eating fried chicken over the summer, and a desire to erase last season from his memory. "I feel a lot better; I'm moving a lot better," he said. "It took weight off the joints. I took a page out of the Tim Duncan book. I'm 32 and I noticed when he got into his early 30s he started slimming down and took it to a whole other level. It was something I needed to do." Jefferson averaged 8.1 points and 4.2 rebounds in 66 games with the Pacers last season. Although his stats were decent for someone playing 14.1 minutes per game, the fact he wasn't in condition to play more was a disappointment to him and to management. He also struggled with his mobility, a crucial asset in the modern NBA. "I try not to look back on it because it's not something I want to look back at," he said of last season. "I know I didn't do nowhere near what they brought me here to do and I had to go into the off-season with a bad taste in my mouth, so I did something about it. "If I had been satisfied with last season that would show you the type of person I am, and I'm not that type of person." The upside of last season, Jefferson said, is that it provided motivation for change. "It got me to where I am now, so in a way I'm glad it happened." 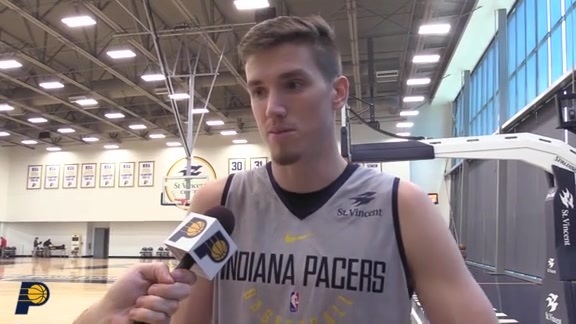 The name most often mentioned when players were asked if anyone has stood out or surprised during the early, informal scrimmages was Domantas Sabonis, one of the players acquired from Oklahoma City in the trade for George. Sabonis averaged 5.9 points as a rookie for the Thunder last season while starting 66 of the 81 games in which he played. He's regarded as a classic role player who plays physically around the basket, but also can step out and hit jump shots. He shot well from the 3-point line early in the season, but his percentage dropped off (to .321) as the season progressed. "He's been really good," Glenn Robinson III said. "He's able to set that screen and roll and attack, but also able to pop out and shoot. The thing I've noticed is, he's effective down there in the post. We need a big bruiser like that, and he's willing to do it all for the team." "Sabonis has jumped out to me," he said. "He obviously was underutilized last summer being a rookie. I think he's grown since last year, probably put on a couple inches. He's strong, he's got a really decent post-up game, and he shoots it really well." Sabonis, for the record, said he hasn't been measured and isn't sure if he's grown. Collison, meanwhile, put in a plug for Stephenson. "Lance has looked real good," he said. "He looks like himself again."